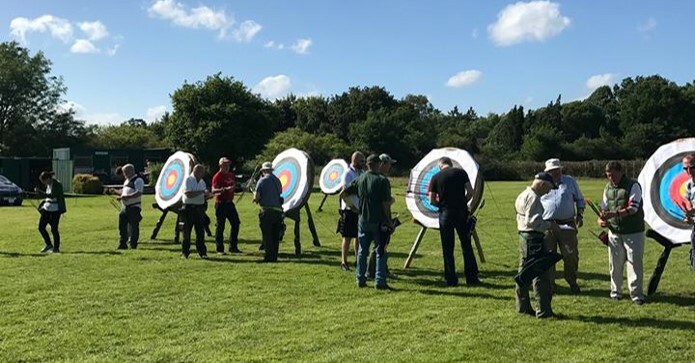 Reigate Priory Bowmen was founded in 1905, and although over 100 years old, our objective has remained the same: to promote and enjoy archery! Our outdoor shooting ground is located in Brockham, where archers are able to shoot up to 100 yards. The range is permanently set out with targets at all distances, and is open to members 7 days a week, 365 days a year, weather permitting. Our facilities include a clubhouse, a permanent shooting line shelter (better known as “the Bus Shelter”), toilets and on-site parking. Although we don’t have running water, we do have electricity – not that you’d notice, as most of our time is spent on the field! If you do plan to be at the club all day, we advise individuals to bring their own water supply to avoid dehydration. As a social club, we hold plenty of fun shoots, and during the summer months, we have a club night on a Tuesday evening, after which members sometimes pop to the local for some refreshments. 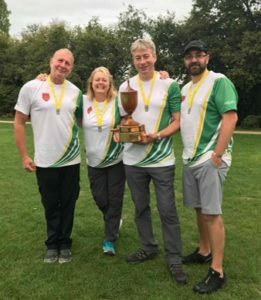 Coaching is available to archers on Sunday afternoons and on Tuesday evenings during the summer months (subject to coach availability). However, our main Club day is Sunday morning. The rounds shot on these days will depend on the weather conditions, with suggested rounds on our shooting programme. Throughout the year, we also hold a number of Club competitions (shown in our shooting calendar). During the winter, we offer an indoor shooting facility (for an additional fee) to our members. Indoors, members can shoot rounds, whilst our coaches hold our indoor beginner’s course. If you would like to join Reigate Priory Bowmen, please email info@reigatepriorybowmen.org.uk for more information. If you’ve never shot before and would like to participate in one of our beginner’s courses, please refer to our “courses” page.